The Cleveland Movie Blog: Retro-Halloween Weekend at the Auto Rama Drive-in isn't clowning around, Oct. 7 - 8. 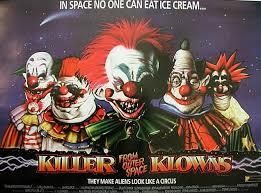 Retro-Halloween Weekend at the Auto Rama Drive-in isn't clowning around, Oct. 7 - 8. Evil clowns, as we know, have brought this country to her knees. The clown hysteria is so prevalent that schools and rural cops are adopting harsh policies towards people who suddenly show up as ominous clowns, and there is even a rumor (debunked on Snopes.com but still noteworthy) that Congress has passed special legislation passed a “shoot to kill” policy for common citizens when confronted by rogue clowns. So in that kind of atmosphere, who would have the guts to show a classic evil clown movie…and have a Halloween costume contest to go along with it? The Aut-O-Rama Twin Drive-In in North Ridgeville would. It was probably a programming decision made months before the current clownpocalypse, but still pretty out there. Founded in 1965 and still owned and operated by the Sherman Family, the twin-screen drive-in is a cherished survivor of the golden age of drive-in movies. While the Aut-O-Rama generally curtails its cinematic season around now with the onset of winter, this weekend the place is adding a special Retro Halloween Weekend in mid-October. For two nights, Friday and Saturday, marathon horror flicks will dominate the two giant outdoor screens after dark. Recognizing the unique family/grindhouse dichotomy of drive-in culture, one of the twin screens will showcase family-friendly spooky movies in the G- and PG-classes: HOTEL TRANSYLVANIA 2, CASPER, the Jim Henson/Roald Dahl project THE WITCHES and the R.L. Stein bigscreen translation GOOSEBUMPS. The other screen will show nastier things and cult classics, beginning with KILLER KLOWNS FROM OUTER SPACE, John Carpenter’s original HALLOWEEN, the first Sean Cunningham FRIDAY THE 13TH and the Clive Barker adaptation CANDYMAN. There will also be trick-or-treating, raffles and a costume contest. Which likely will bring out the evil clown element. Just want to say, don’t be surprised if a massive show of police, national guard, PTA moms and other clown-haters are there to control any evil clown activity (meanwhile, with the rest of Lorain County unguarded, street gangs will loot and rob at will). Standard show rates are $9 for adults, $4 for kids 11 and under. The location is 33395 Lorain Road in North Ridgeville. For more information go online to http://autoramadrivein.com/special_events.php. Or call (440) 327-9595.